Although PSA Peugeot-Citroën is headquartered in Paris, Peugeot chose to open its museum in its hometown of Sochaux, France. Located a stone’s throw away from the automaker’s very first factory, the museum is home to well over 100 vehicles that are swapped around on a regular basis. We saw an impressive display of pre-war cars dating from Peugeot’s earliest days and a large collection of successful race cars including several Dakar-going models, a 504 that participated in the 1975 edition of the Safari Rally and a 204 that competed in the East African Safari. Commercial vehicles were relatively well represented but some of the less popular Peugeots were largely left out. L’Aventure Peugeot also boasts an impressive collection of other objects Peugeot has built over the years including bicycles, tricycles, pepper mills, blenders, drills, saw blades, wood-working tools and even sewing machines. As a side note, the museum only showcases Peugeots, not cars built by the PSA group. 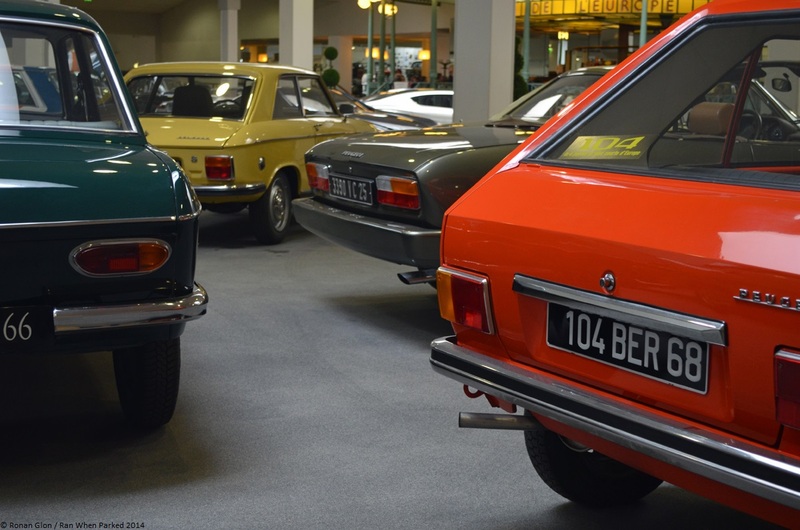 Citroën’s collection is in Paris and the Simca / Talbot museum is located on the grounds of the historic Poissy factory. One of the most intriguing cars on display during our visit was a 402 set up to run on carbon monoxide. Peugeot fine-tuned the technology in the late 1930s because it sensed the war that was brewing in Europe would lead to a shortage in gasoline. The system consists of a wood stove-like oven mounted on the back of a long-wheelbase 402 and a network of large metal pipes. The carbon monoxide produced by the charcoal as it slowly burns is routed away from the stove and into a separate storage tank. From there, it runs through a pipe that follows the 402’s roofline, goes through the hood and feeds into the engine’s intake manifold. The stove holds 77 pounds (35 kilos) of charcoal, enough to power the 402 for up to 50 miles (80 kilometers). The charcoal burner adds a hefty 374 pounds (169 kilos) to the 402, lowering its top speed to 40 mph (65 km/h). While the car sounds like a wild prototype that never left the test track, over 2,500 Peugeots were converted to run on carbon monoxide between 1940 and 1945. The L’Aventure Peugeot museum is open seven days a week from 10am to 6pm except on certain holidays like Christmas and New Years. Visitors can take a break from the tour by grabbing a drink or a bite at the museum’s brewery. Our photos are split up into two galleries: Street cars and race cars. In the interest of space we have largely left out detailed shots (door handles, headlights and so forth) but if you would like more pictures of a particular car don’t hesitate to contact us or, better yet, visit the museum for yourself in Sochaux. “Run on carbon monoxide” is perhaps a bit misleading. It’s actually the various hydrocarbons in the gasifier’s output that are serving as the fuel, per se. Some great cars there. Interestingly there was a TV show here in the UK recently called Wartime Farm where they recreated the conditions of farming during the conflict. One thing they did on there was to convert a 1930’s ambulance to run on gas generated from a word burning stove mounted on the front bumper and “condensed” thru piping into the engine bay to the carb. It worked well for them – the restricted range would have actually complimented WW2 conditions for the motorist.